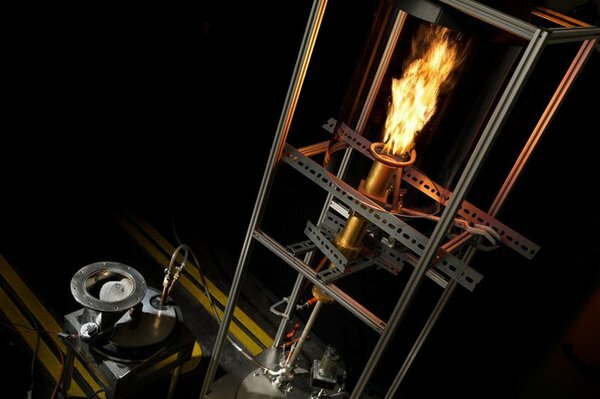 The student team SOLID, of the Eindhoven University of Technology, has built a working proof-of-concept installation for the incineration of iron powder. The installation has a capacity of 20 kilowatts, comparable to the average central heating boiler. There are no CO2 emissions involved and the residual product is fully recyclable. The team is working on a sustainable technology that can be a solution for industrial gas users: iron combustion. Iron powder is an excellent fuel. The Eindhoven students of Team Solid have been working on this innovative fuel for some time now. The installation they have built burns the iron powder and generates hot water, heat and electricity. Iron powder has the potential to fulfil an important role in tomorrow’s energy supply. The powder, which has a high energy density, is converted into a large amount of energy during combustion. The residual product, metal oxide, can then be converted back into new iron powder in a sustainable and environmentally friendly way. This makes it a completely circular process. Also, when using this technique, one does not have to worry about CO2 emissions. Unlike other elements used in the storage of energy, there is no lack of iron at all; it is the most common element on earth. Thanks to its energy density, which is many times higher than that of conventional batteries, the metal is also extremely suitable for use in sectors such as the maritime sector. It can be transported easily and relatively compactly. The next goal of Team Solid is to build a mobile, industrial installation with a capacity of 100 kilowatts. In order to realise this, the team is still looking for investors.